I knotted this bracelet literally years ago, and I just found it as I was messing with my stuff today. I love it because it's rainbow so I put it on. This is made from 6 colors of DMC embroidery floss using a knotting technique with half-hitch knots. It's basically macrame but this isn't usually the side you'd see if you were doing a macrame piece. For some reason macrame usually shows the other side which I'll try to take a picture of later so you can see how different it looks. 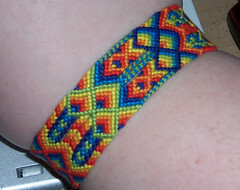 This is a REALLY elaborate version of the knotted bracelets i've posted pictures of before. I'm really glad I found it- it really brightens up my day and it's so nice, stands out.. If you're interested in having a bracelet like this, contact me through my etsy store for details and pricing- you can have up to 6 colors for one this wide, and the price i assure you will be very reasonable but be aware that these bracelets take a really long time to do and are really complicated so it won't be cheap. Skinnier ones are avalable here and here and here. I'm a lifelong Frost Mage who grudgingly switches to other specs when my raid leader yells at me, and otherwise just loves to put on pretty clothes and frolic around Azeroth. Ravelry- Where my Stitches at?